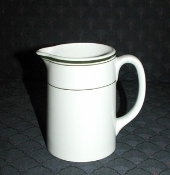 Vintage From Paul is delighted to offer this classic vitrified ware, green stripe creamer from Wood & Sons. The Wood & Sons Vitrified Ware Green Stripe Creamer is in pristine condition. There are no defects or flaws noted. The creamer stands 4-1/4 inches in height, measures 4-1/4 inches from handle to spout. The creamer has a base diameter of 3 inches. The Wood & Sons Vitrified Ware Green Stripe Creamer is hallmarked in black with; "Vitrified Ware by Wood & Sons, Stoke-On-Trent England, B.S.4034, 1-92".